What can they do? How well can they do it? 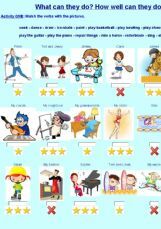 Exercises to revise some basic verbs/actions. 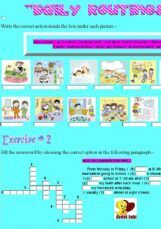 This is my first online exercise ever! 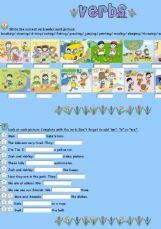 I hope it�s ok... Verbs: match the verb to the picture, complete the sentences, answer with short answers. 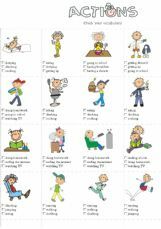 every day actions simple present, copy of ebffs worksheet as it is so nice but my pupils are not yet so advanced to use hers... I will delete it again next week, promise!!! 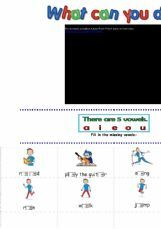 Ss can review simple present actions, how verbs are used with I-He-She, the s-es at the end of the verbs, and frequency adverbs, I did it thinking about my own ss, but unfortunately we don�t have access to internet, well enjoy! 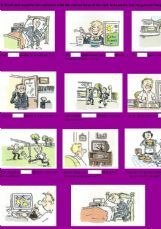 and send me all your observations, please! My first OE. 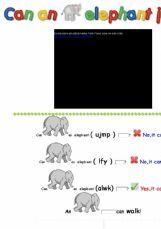 It�s about ACTION VERBS and has 2 simple exercises.